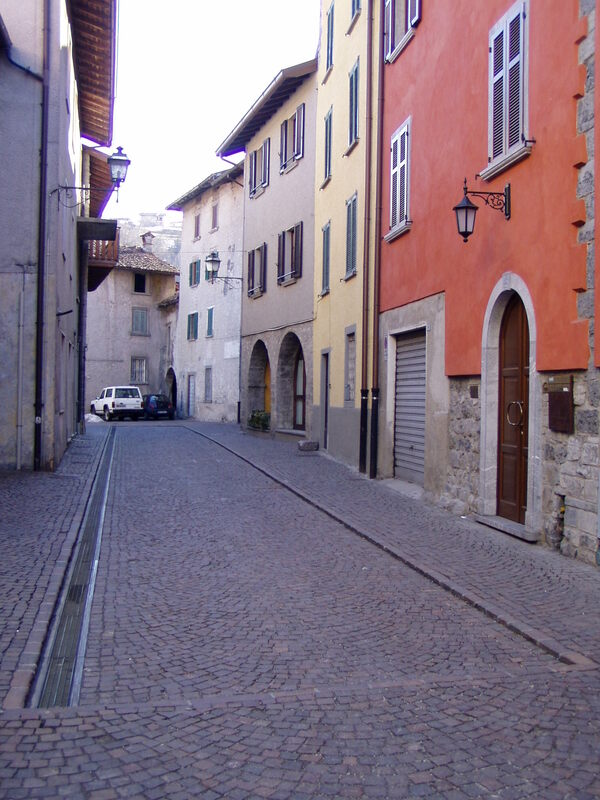 The old town centre of Brembilla was not the same as the current town centre, but it was situated more in the south and had its heart on Piazza Vecchia, including also all those activities different from farming which were vital to the life of the town and the valley. The old town of Brembilla was rebuilt after the expulsion of the Brembillesi (native people of Brembilla) by the Republic of Venice in 1443.Tangible marks of the reconstruction can be observed in the inner buildings next to the arcade in the corner of Piazza Vecchia, where the date A.D. 26th December 1571 can be read. The buildings and arcades that follow one another going up to the church date back to the 14th century and following years, including the one of the Scalinata Vecchia (old stairs). The houses inside and on the sides of both flights of steps, Vecchia and Tridentina, were part of the first rebuilt town and have hosted the council room where the mayor used to hold meetings in the centuries. In this area, you can also find a tavern that dates back to the seventeenth century, 'La taverna del forno'(the tavern of the oven) , whose entrance was situated behind, on the mule-track leading to Piazza Vecchia. 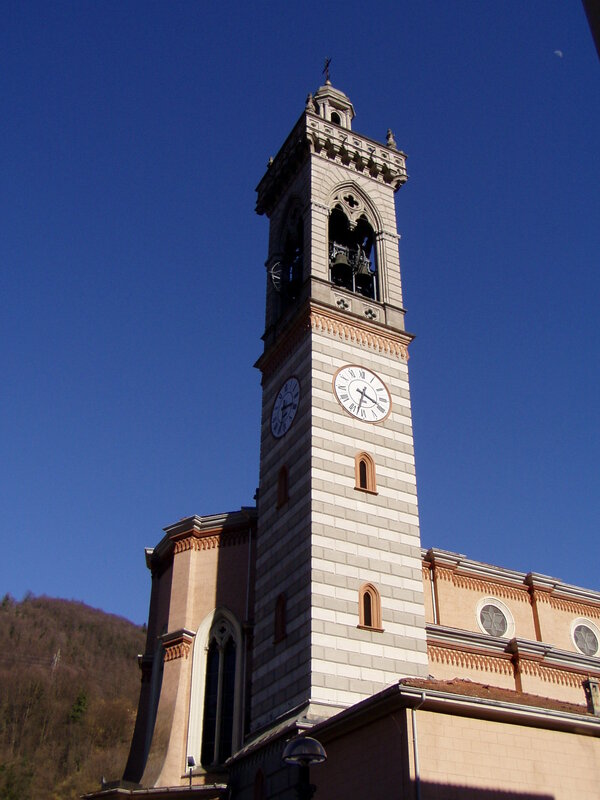 The area close to the second staircase (Brigata Lupi) that leads to the church and the one on Ponte Lambro date back to the eighteenth century. Many important activities and businesses were present in the buildings of the middle of this area, like the seat of the Austrian command, the post office, the 'Banca Agricola' (bank of agriculture), the 'Trattoria del Giardinetto' and 'dello Stemma' (two restaurants). Until the nineteenth century, the area was sorrounded by walls. In fact, the buildings in the historical centre, especially those around the square, show signs of special care and refinement, compared to the other area. We have here two- or three-floor buildings, tangible sign of a different lifestyle. The stables were placed in the undergrounds and in the neighbouring lands where peasants went to work. The stables were also used by the numerous 'Cavalcanti' (carters), who stopped there to rest and load their carts, considering that Brembilla was the trade centre of the valley. 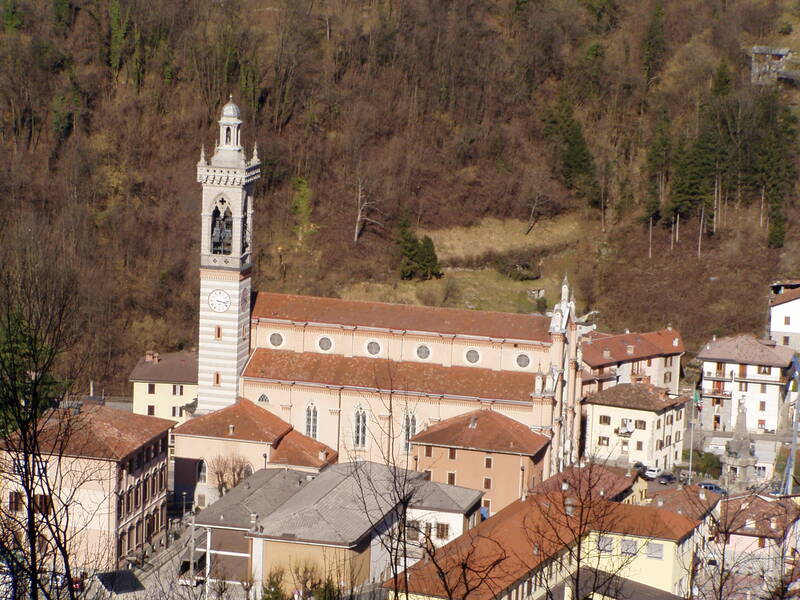 In the second half of eighteenth century, the Scaglia brothers from Imagna Valley arrived and Brembilla started its transformation from a peasant centre to an artisan centre. The first workshops of buttons and wood owned by these families opened as early as the beginning of the nineteenth century in the neighbouring Cadeguerino. In 1830 Brembilla counted 115 inhabitants. They were distributed into 28 families, among them, 16 were peasants, but there were also blacksmiths, hosts, tailors, shoemakers, the town guard, the spice expert, the teacher, the student, which proves that the centre of Brembilla was also a vital point also for non-agricultural activities. Some powerful families used to live here, like the Ambrosioni, extinct around 1920. Around the second half of the nineteenth century, the artisan activities of the Scaglia were moved from Cadeguerino to the southern area of the historical centre, near the bridge of Val Cava, making use of the old mill in Piazza Vecchia to produce energy. Later, the brothers Carminati, coming from Vestasso, opened some new workshops in this area and in 1934 the brothers Giacomo e Pietro Gamba opened the first metal turning in town. Since the end of the nineteenth century, thanks to its artisan development, Brembilla expands southwards, to the Malpensata, through the construction of garages and wood and coal warehouses, essential for the transportion of products. The construction of the Church at the end of the century and of the town council facilitated the development in the north of Piazza Vecchia up to the area of Valletta, moving the town centre in this direction. At the beginning of the twentienth century, with the introduction of the railway in Ponti di Brembilla (1907) , Brembilla started to aim at tourism, enhancing the value of its environment and the high quality of its sulphureous water. Many restaurants and hotels opened in these years, like the hotel Sole, the restaurant Regina, the hotel Italia, the hotel Posta and also the realisation of the current park on Rizzi street, which actively contributes to giving Brembilla its current structure. Cadeguerino (Caguarì) is one of the oldest and most populous area and it is situated between the old Brembilla and Cadelfoglia. It is assumed that the oldest spot was the one inside the wonderful arcade. In the stone of the left arcade, two dates are engraved: 1574 and 1663 (it is thought that the first one refers to the construction and the second one to the first restoration), while we can recognize the eighteenth century style of the other arcades. The old centre was sorrounded by walls, with an access 20 metres far from the current main road, where the bases of a big door were present in central position. You can still observe the scarce homogeneity of stones used for the building of some houses, proof of the shortage of construction materials; however, some facades display rounded and smoothed stones coming from rivers. In 1830 Brembilla took a census of 54 inhabitants in 13 families. The town differed widely from the other areas whose inhabitants were mainly peasants: here there were 4 Scaglia families, owners of workshops of button and wood, two property owners, a shoemaker, two waxers, the first artisan centre settled in Brembilla. 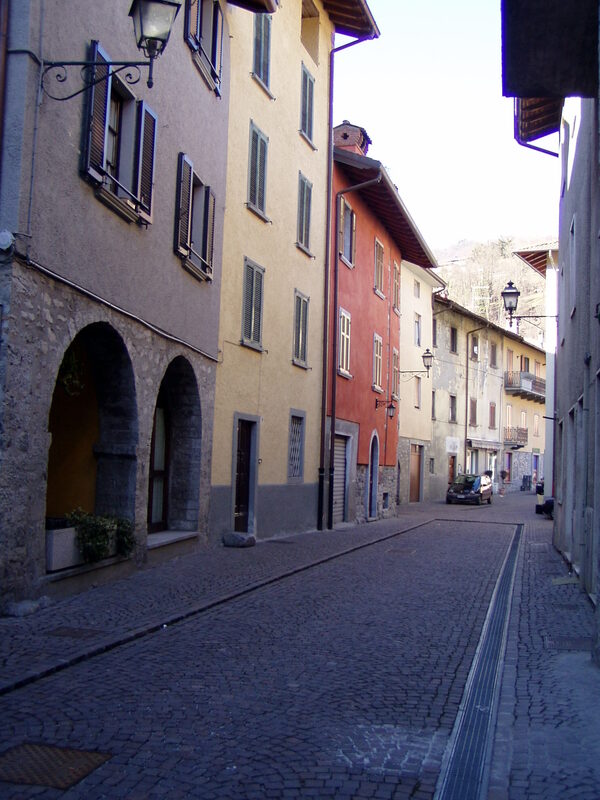 Until the half of twentieenth century, the area was dominated by the powerful family of Carminati (Pinöi), whose residence, now radically different, on the small square that delimits the narrow road, still hosts many fresques. In the surroundings of Cadeguerino, on the other side of the river Brembilla, you can observe the mill Orefice or Ories, located on the last part of Val Rudino, a few metres far from the river. Its construction is thought to date back to earlier than the sixteenth century. It stopped working in 1953. It was one of the most important mills in Brembilla Valley in the past: mill “Nisa” in Valle del Lisco in Malentrata, mill Busi in Val Rudino , the mill in di Laxolo, in Cadelfoglia, in Piazza Vecchia, dell'Isola, in Chignolo, in Magnavacche, the Mulinetto 'Mülinèt', Gallone and the mill in Gerosa. Another important area is La Valletta (La Alèta), born with the development of the centre of Brembilla towards the north in the second half of the nineteenth century, thus unifying Brembilla to Cadeguerino.